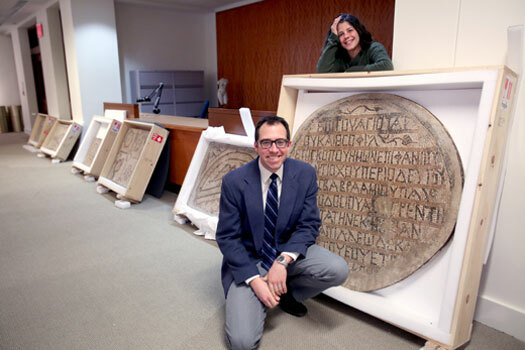 Theology professor Michael Peppard (front) and University art curator Jennifer Udell with Fordham’s latest acqusitions, which will be displayed in the Museum of Greek, Etruscan and Roman Art. Below, a church dedication inscription, 463 C.E. Fordham University has acquired its first Christian artifacts from antiquity: nine mosaics from a church built in the fifth century, a time when Christian art was still inflected with pagan images and the cross had yet to become the dominant symbol of the faith. The mosaics formed part of a church floor located in what is now northwest Syria. An anonymous donor gave them to Fordham’s Museum of Greek, Etruscan and Roman Art in December, expanding the historical sweep of a collection that was already the largest of its type among universities in the New York region. Located at Fordham’s Rose Hill campus, the Museum of Greek, Etruscan and Roman Art already contains more than 260 objects, dating from the 10th century B.C. through the third century A.D., that illustrate the material culture of the ancient Mediterranean region. The nine new pieces, with their pictures and inscriptions, offer a window into a transitional time in the church. Seven of the mosaics show animals or geometric shapes, making them typical of a period in which church floors generally featured things like flora and fauna or sunbursts, said Michael Peppard, Ph.D., assistant professor of theology. Generally absent are images of Christ, the cross, or human figures. Udell noted that one of the mosaics shows a peacock, “which early on became a symbol of the resurrection.” In an example of how motifs crossed religious boundaries at the time, she said, the peacock image was also popular in synagogues. The name of the bishop cited in the mosaics, Epiphanius, was common at the time but probably denotes Epiphanius, bishop of Apamea in the 450s and 460s. Peppard and Udell are conducting research to answer this and other questions about the mosaics. The text also mentions another official, the periodeutês—a kind of auxiliary bishop—who provided pastoral care for rural churches in Syria at the time, according to Peppard. It’s an office that was prominent for a few hundred years before fading away, although its name is still used by modern-day Maronite Catholics, he said. In light of the present civil conflict in Syria and legitimate concerns for the security of that country’s ancient archaeological sites and artifacts, it should be noted that the recent gift to Fordham of the nine mosaics described in the above article was accepted following a thorough provenance review in accordance with University policy and careful examination of accompanying, official documentation attesting to the mosaics’ legal export to the United States in 1972. Eyewitness testimony and other evidence further point to their excavation no later than 1968. A forthcoming article in the Zeitschrift für Papyrologie und Epigraphik (Journal for Papyrology and Epigraphy) by Fordham theology professor Michael Peppard, Ph.D., and a future article by Jennifer Udell, Ph.D., curator of University art, will offer thorough examinations of the mosaics’ ancient and modern histories.